The Government’s cavalier handling of our personal data is now well publicised. What mystifies me is what’s keeping the phishing scammers from taking advantage of it. I haven’t yet seen any emails purporting to be from the Government trying to get people to register to protect their details. It’s just a matter of time before some scammer realises that they don’t need the HMRC discs, just enough people who are so worried about the HMRC scandal that they don’t think straight when reading about a way to protect their personal information. I’ve been asked about this, so here is a brief summary of the current abilities and limitations of Fedora 8 regarding printer status feedback i.e. getting errors and warnings (paper out, low ink, that sort of thing) to the person who needs to know. Looks like the birds in this area are wise to the old “peck the milk bottle tops” trick. But do birds like milk? I’m not sure I really see what’s in it for them except to annoy people. 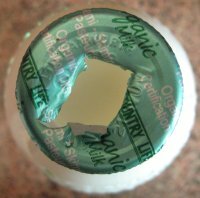 Of course, I’m assuming it was done by a bird and that the milkman didn’t put his thumb through the top by accident — but if you look closely, it looks like there is a small hole that’s been pecked (see exhibit A, left). Anyone know what sort of bird does this, and why? Perhaps magpies, trying to collect silvery things? I’ve just made a quick screencast showing the “new printer” notification bubbles, as well as a “low ink” notification when printing to an HP printer connected to another machine. I used Fedora 8 “Werewolf” (rc3 plus updates) for this. I didn’t bother showing a “paper out” notification — it looks largely the same. Not long to wait now for the DVD box set of The Wonder Years. You can pre-order it now at Amazon… but can that release date really be right? You are currently browsing the PRINT HEAD weblog archives for November, 2007.